Goldfish are a good choice for beginners as they are quite easy to keep. However, they are not as hardy as some people think they are and they do need proper care (see Golden Rules). Also, they live for quite a long time, they respond to their owner and are probably the closest you can get to having fish as ‘pets’ (but see Handling). Goldfish will become very tame in a tank and will investigate hands and fingers during tank maintenance, and they will feed from the hand (but see Hygiene). Goldfish feed by rapidly opening their jaws into a tube which reduces the water pressure in the mouth and causes the food to rush in. They have pharyngeal ‘teeth’ (small bony tooth-like structures) at the back of their jaws to grind food before passing it into the gut. Goldfish have a protective mucous coating over their scales and anything that damages this should be avoided, such as ‘petting’. Goldfish are adapted to the diurnal cycle of day and night, so should be provided with light during the daytime, either natural if sufficient (and without the risk of overheating the water) or from fluorescent tubes. There is always a fine balance between the right amount of light for seeing the fish and permitting plant growth and excess light that can cause runaway algal blooms that wreck a tank. If your lighting is causing problems with algae, reduce it and check for causes of poor water quality. Hardier types such as common goldfish may be kept in outdoor ponds that freeze over in winter (the fish are safe if the pond is deep enough and a small hole in the ice is maintained), so the only real reason for a tank heater is to stabilize temperature if it is otherwise subject to unnatural fluctuations that could stress the fish. Temperatures of 20°C/70°F should be regarded as the upper limit, and temperatures of 10°C/50°F as the lower limit for the fancier varieties. Goldfish sift substrate looking for food, so the tank substrate should not be sharp, too large (that could get stuck in the mouth) or too small (that could be ingested). Rounded beach gravel is ideal (if it is free of shell fragments that will harden the water or could cut the fish). The constant sifting will level most aquascaping undertaken by the fishkeeper, so retaining rocks or bogwood are useful. 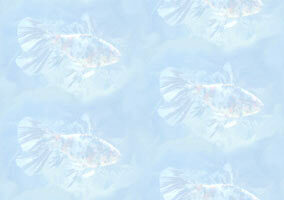 See our Aquarium Calculator for how many goldfish you can keep in a tank of given dimensions. See the various goldfish pages for how large each variety can grow, and please note that it is a myth that goldfish size is limited by tank space: you should allow for adult-sized fish when working out your stocking level. Most tap water in UK falls within the ideal pH range described above, as the water companies modify the pH to prevent pipe corrosion, so goldfish keepers can safely use tap water as long as it is ‘conditioned’ to remove the chlorine/chloramine added by the water companies to kill microbes and make it safe for human consumption. To find out the pH and hardness of local tap water, one can purchase the appropriate test kits from aquarium shops, ask experienced fishkeepers in the area or ask the water company. See Golden Rules for further information and advice. Please Note : Unconditioned water will kill filter bacteria that detoxify the ammonia secreted by fish to nitrite and nitrate. Remove some tank water for cleaning filters. Traditional aquarium salt (which is different from table or cooking salt and should be bought from aquarium shops) is a traditional cure for such diseases as fungus and finrot, or general ill health such as clamping of fins and listlessness. The correct dosage for goldfish (which is different for tropicals) will be stated on the packaging. Fishkeepers need to learn quickly to recognize the difference between the smaller white spots found anywhere on the body and fins that are the cysts of ‘Ich’ (the Ichthyophthirius parasite - see Diseases) and the larger breeding tubercles (white pimples) on the gill covers and on the leading edge of the pectoral fins of male fish during the breeding season (see Breeding).